Where Will General Electric Be in 10 Years? New CEO John Flannery promised to unveil a new strategy by November. Why wait? Here are a few moves General Electric could make in the next decade. It's probably not a good sign when Warren Buffett gives a popular stock the cold shoulder. Yet he's surprisingly done just that with digital industrial conglomerate General Electric Company (NYSE:GE). The company faces more uncertainty about its future today than it has since the Great Recession, which has slashed the stock 23% in 2017. That's an incredible reduction in valuation for a $211 billion company. To be fair, there's a solid argument for the stock's woeful performance. Earnings have struggled in recent quarters, which has some on Wall Street worried that selling off the cash cow financial services business may have been the wrong move. Industrial offerings simply haven't met ambitious earnings targets. The mammoth task of righting the ship now falls to new CEO John Flannery, the former head of GE Healthcare. His team is currently conducting a comprehensive review of all business segments and has promised to release a new strategy by November. Rather than wait, here are several moves that General Electric could make in the next 10 years. Flannery knows that the next few years will be critical. Therefore, investors can expect moves that boost margins and profits, nurture the best high growth opportunities already in place, and reshape the conglomerate's long-term footing with acquisitions and divestitures. Double down on GE Healthcare units: This is an easy one for the simple reason that new CEO has already uttered the exact words "double down on life sciences." The difference is he said that before becoming CEO. Now, he can really throw the industrial giant's weight behind the bioeconomy. That will be easy to do, given General Electric's expansive portfolio of life sciences R&D products that cover everything from benchtop (and robot-aided) experimentation to biomanufacturing and purification of biologic drugs and cell therapies. Indeed, the company plans to build a $1 billion-per-year business around cell therapy manufacturing alone in the next decade. Better yet, life sciences offer unparalleled high margin revenue opportunities -- right now -- to make up for shortfalls or restructuring costs elsewhere in the industrial portfolio. 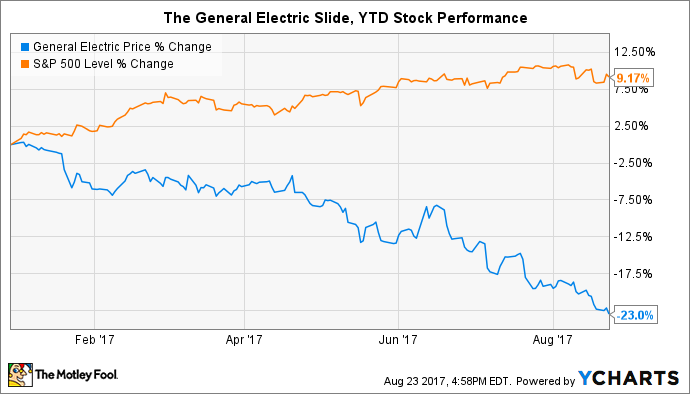 Don't be surprised if General Electric goes on an acquisition binge to speed things up. Bioprocess leader Repligen (NASDAQ:RGEN) is a perfect fit for the conglomerate's push into biopharmaceutical manufacturing. The pair already work extensively together (GE Healthcare accounted for 28% of the bioprocess company's revenue in the first half of this year), and Repligen has world-class manufacturing capabilities in Waltham, Mass. -- a few miles from the digital industrial's headquarters in Boston. Acquire Desktop Metal to bolster metal 3-D printing capabilities: Desktop Metal is the hottest start-up in 3-D printing. As the name implies, it's focused on metal objects. As the name doesn't imply, it's launching an industrial machine in 2018 that achieves the same cost per part whether you make one widget or 100,000 of them. General Electric is a major investor and customer of the start-up. You could argue the conglomerate has single handedly catalyzed the rise of a robust ecosystem in metal 3-D printing, from powder manufacturers to printer manufacturers to in-house testing of objects in real-world conditions. Its GE Additive business segment has made headlines by printing complex parts for jet engines and locomotives, but it wants to expand that substantially. Acquiring the best manufacturing technology the industry has to offer -- and what may be the most valuable 3-D printing company -- would certainly boost this high-growth opportunity. Acquire a major solar manufacturer: My Foolish colleague Travis Hoium recently suggested that General Electric should make enormous bets on renewable energy. I couldn't agree more. GE Renewables contributed 8% and 3% of total industrial segment revenue and profit, respectively, in 2016. Despite the low profit margin, the renewable business grew revenue 44% from 2015 thanks to increased sales volume for wind turbines and hydro technology, mostly contributed from the Alstom acquisition. There's long-term growth potential here, but considering wind and hydro are where the renewable portfolio ends, and that leading solar panel manufacturers are treading water as they make difficult but necessary decisions this year, it may be time to pull out the elephant gun -- and soon. First Solar and SunPower could be acquired for a combined $10 billion, which would instantly make General Electric a leading global provider of solar panels. Not only is that chump change for the conglomerate, but if earnings return to historical levels for the solar leaders -- First Solar reported net income of $546 million in 2015, while SunPower turned in net income of $246 million in 2014 -- this splash would achieve earnings growth soon and in the long run. What does the back half of the next decade entail? As General Electric reshapes and restructures its portfolio in the next five years, investors will begin to see flashes of a new identity. And they'll like it. A lot. Industrial revenue and profits will begin to grow again with acquisitions in GE Healthcare, GE Additive, and GE Renewables. By the early 2020's the success of GE Digital -- already a $3.6 billion-per-year business -- will make shareholders question what the right balance is between "digital" and "industrial". Digital will win out, which will cause a new strategy to be implemented that focuses more on providing high margin digital services and less on 20th century industrial products -- in specific industries, at least. Divest the oil-field services unit: The next decade will be incredible for American energy, which will disrupt global energy flows virtually overnight. North America is on the road to being completely energy independent. In fact, it's about to become a major energy exporter. That's great news for the nation and a handful of companies, but the next boom may be the last true energy revolution for American oil and gas. The incredible success of wind, which today provides 6% of American electricity; solar, providing 1% of American electricity; and electric cars, which will eat away at gasoline and diesel consumption much faster than anticipated, will cause drastic reductions in oil and gas investments. That means the recent acquisition of Baker Hughes, a GE Company (NYSE:BHGE), which is 62.5% owned by General Electric, will be jettisoned from the portfolio. Shocking? Perhaps, but the growth of wind and solar will make this a much easier decision by 2027. If the company gets the timing right, then it could enjoy most of the coming boom and avoid the worst of the next down cycle. Divest the nuclear business: GE Hitachi, the nuclear arm of General Electric that is really a joint venture, is a leading supplier of reactor design and maintenance services for the nuclear industry. There's no way it would be divested, right? Well, if 2017 has proved anything, it's that America -- the country that trains all nuclear inspectors for the International Atomic Energy Agency -- has lost its global leadership role in nuclear power. Uncle Sam doesn't seem primed to build new traditional nuclear reactors without massive government intervention, while next-generation reactor designs may find it difficult to pierce through the "renewables vs. clean energy" divide by the time they're ready for licensing. General Electric could continue selling reactors and services internationally, but many industrialized nations are turning their backs on atomic energy as well. Meanwhile, the few countries that are building new reactors are also encouraging home-grown reactor designs, which will squeeze out the legacy engineering firms. Throw in a steadily increasing stream of nuclear power plant closures in the United States, and the conglomerate will be tempted to wind this business down. It's a shocker now, but within 10 years this move may seem long overdue. This is a fun thought experiment for investors to conduct today only because there are so many questions about General Electric's future. While these predictions aren't guaranteed to happen, taking the time to read through the digital industrial conglomerate's SEC filings and presentations have given me confidence that the long-term future of the company is pretty bright. With the stock down 23% year to date, it's difficult for me not to believe this is a rare buying opportunity for one of the world's highest impact companies.